Happy Spring! It's just unbelievable how fast this school year has flown, but I guess we always say that. It seems we are all amazed by time - how fast it seems but also how slow. March was Vincent van Gogh's birthday month so we spent several weeks learning more about him & being inspired by his amazing work. It was fascinating (& tragic) to learn that he passed away not knowing the value of his work. We learned that in his short 10 year painting 'career' he painted over 2,100 paintings but sold only 1. 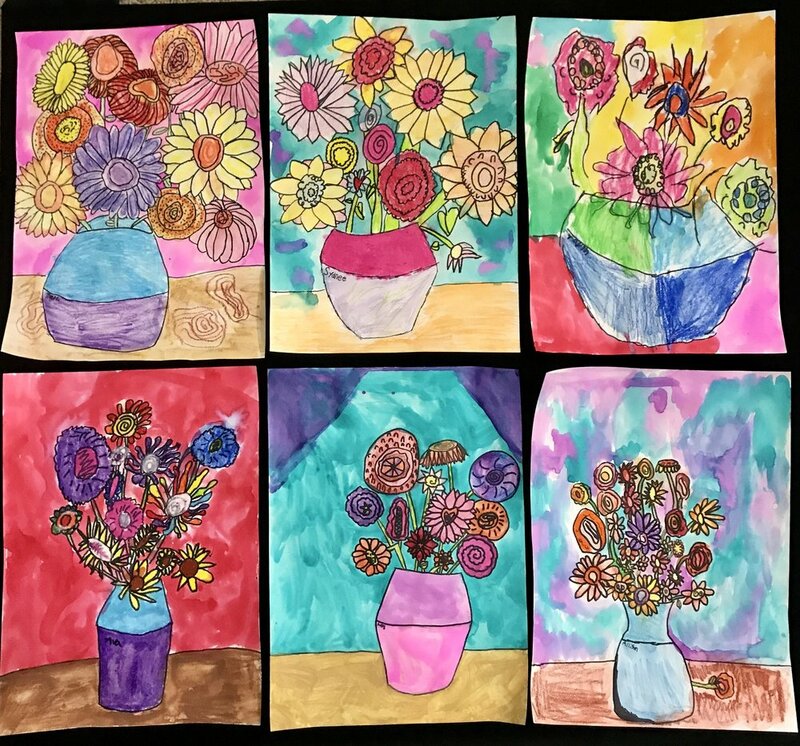 He passed away at the young age of 37 :( My students did an amazing job of creating their own van Gogh inspired flower paintings. Summer is weeks away! This will be my 5th summer to offer "Let's Create...like the Masters!' art camps & I can't wait! There are only three spots remaining across the five sessions, so register soon! See the "Let's Create 2017" tab for all the info! I am offering a $20 off discount if you register by May 25th! Also thinking ahead to the upcoming 2017-2018 school year -- I have just updated all the information for my 2017-2018 school year art lessons - I will be offering 5 classes -- a homeschool class & four after school classes. Click on the "Art Lessons" tab for all the info. Registration opens May 1st! Last month I had the privilege of hanging some of my work in the "Patriarch" craft beer lounge in downtown Edmond! I have been quite busy painting & feeling out the rough patches & wonderful patches of being an artist. It is a constant learning journey, one of which I am thankful to be on. 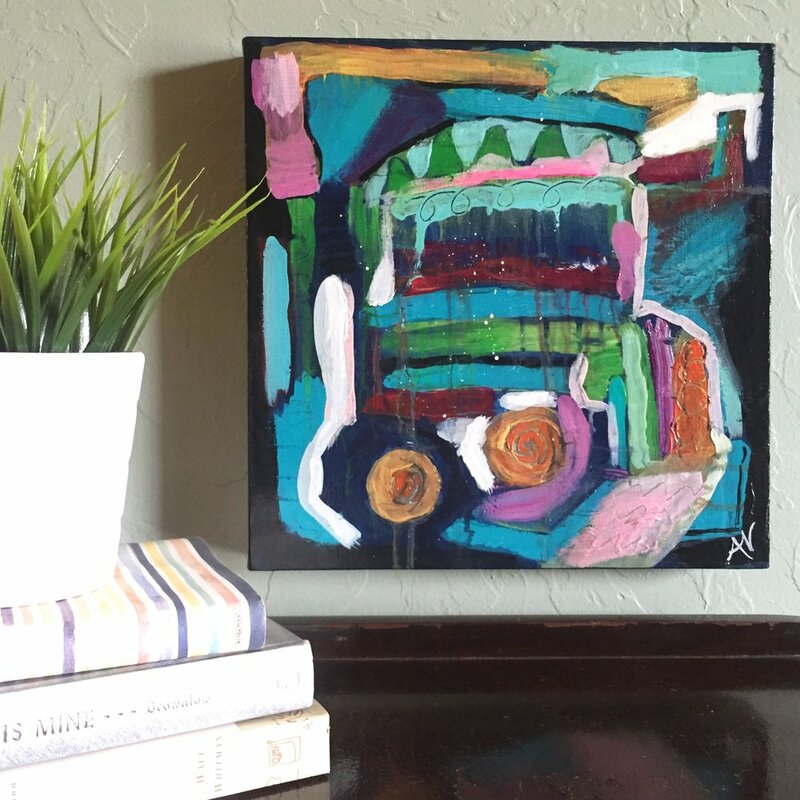 All of my paintings can be found on my Etsy shop -- alisanelsonstudio.etsy.com including many new ones! Time for an update!! January quickly passed us by and somehow we are already into February of the 2016/17 school year! Only three more months with my sweet artists and summer camps will be here before we know it! I have so much to share! 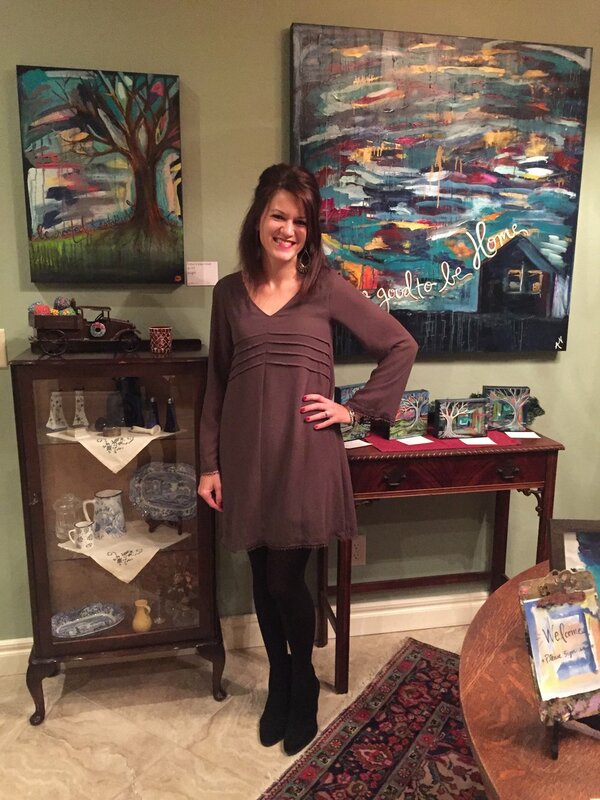 In January I began my 5th year owning & operating Alisa Nelson Studio. I absolutely LOVE what I do - getting to share art with others is so much fun and five years ago I never would have imagined it looking like this. I began this semester with my largest student enrollment so far - 4 classes of 33 students. Plus my daughter, who loves art (I hope it sticks! :)) I currently have one opening in my Thursday, 4:15-5:15 class! Contact me asap if you are interested. Also, be on the lookout for 2017 "Let's Create! 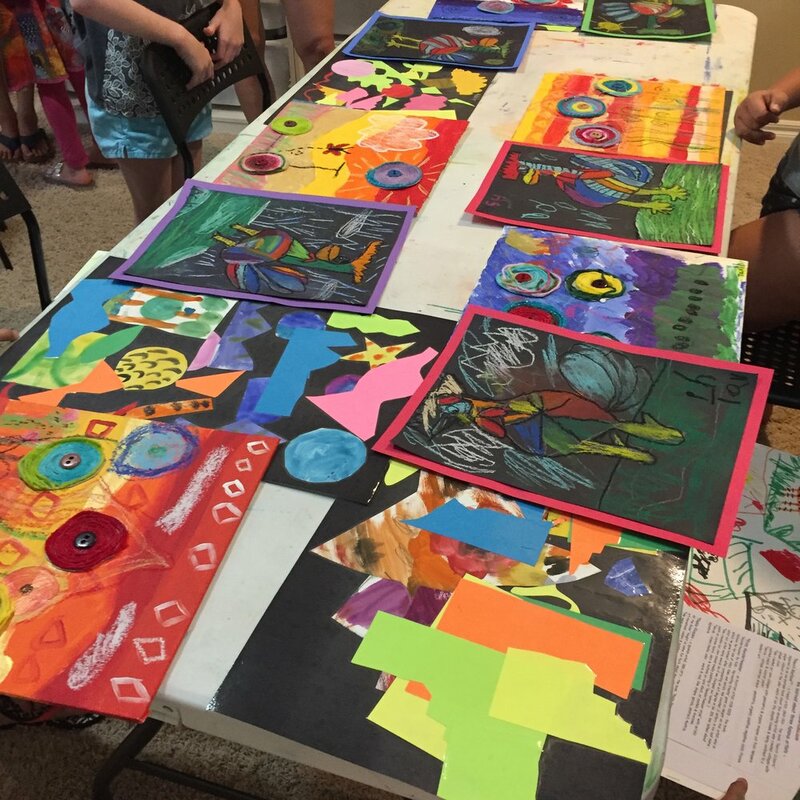 like the Masters" Summer Art Camps info. I will post dates by the end of the month and enrollment will begin March 1. Yay!! Last month we were inspired by Grandma Moses' wonderful art. She didn't begin painting until she was 70, and painted over 1,500 paintings from that time until she passed at age 101! That sure does take all excuses away on trying something new, doesn't it!? I loved several things that she said - "Anyone can paint!" She is definitely a testament to that. She also said, "Paint what you know." You can see that in her amazing story-type landscapes. My students & I agreed that it felt as if you could hop into one of her paintings & interact with the characters & scenes. She also said, "Everyone has something inside to give." Thank you, Grandma Moses, for what you gave to the art community. January also included the 2017 Statewide Youth Impressions Juried Art Show, put on each year by the Fine Arts Institute of Edmond. I love having my students participate in this show and share their art with the community. Together we entered 23 wonderful pieces of art, and several of my artists brought home ribbons. Last but not least, Alisa Nelson Studio has been announced as a finalist in the Metro Family, 2017 Family Favorites for art studio/art lessons! I am still blown away by this, but thrilled to be recognized, especially next to the OKC Museum of Art & the FAI, both amazing contributors of art to our city!! I think it's time for an update! 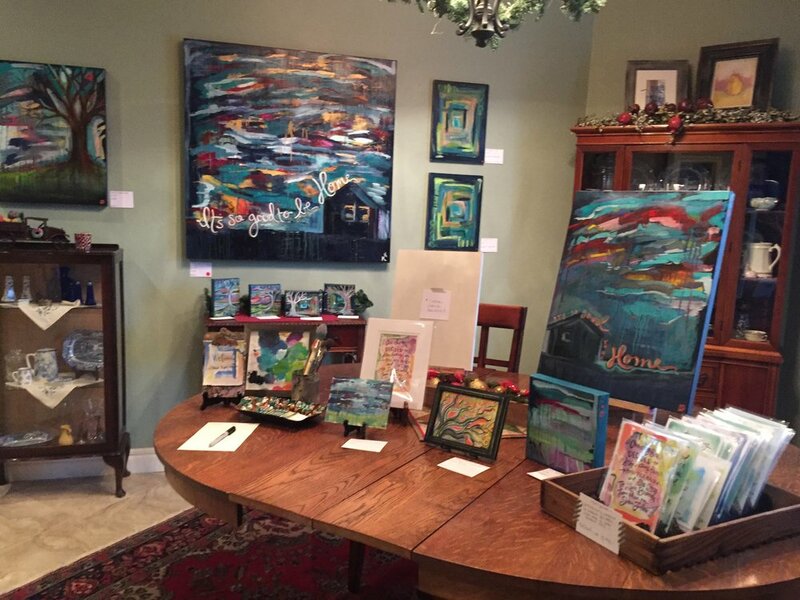 There have been so many exciting things going on at Alisa Nelson Studio! Due to increasing interest & a growing waitlist, I am opening a 4th class, beginning in January! The new class time will be Thursdays, 4:15-5:15. Click on the "Art Lessons" tab above for all the details! My other three classes are currently full & wait list only. Andy & I hosted my first art show last week! I have learned that I work best with deadlines, so it was an exciting challenge to complete so many paintings for my show! I am enjoying working with bold color & experimenting with materials - my new favorites are aquabord, liquid gold leaf & wood panels. Combining realistic elements and abstract elements in the same paintings has become a favorite of mine - trees, lettering, movement of color with spraying & drips - more of these things on the way! It's a joy to be finding my voice as an artist - I'm sure I will continue to discover & change & grow more and more as I take the time to paint each day. Being a creative is such a discipline - painting even when I don't feel like painting - this is a thing! Van Gogh once said, "If you hear a voice within you say 'you cannot paint,' then by all means paint, and that voice will be silenced." I have found this to be SO true. Thank you for joining me on my creative journey! Register soon! I keep my class sizes small to create the best environment for creating & learning! January flew by & I can't believe we are halfway through February! 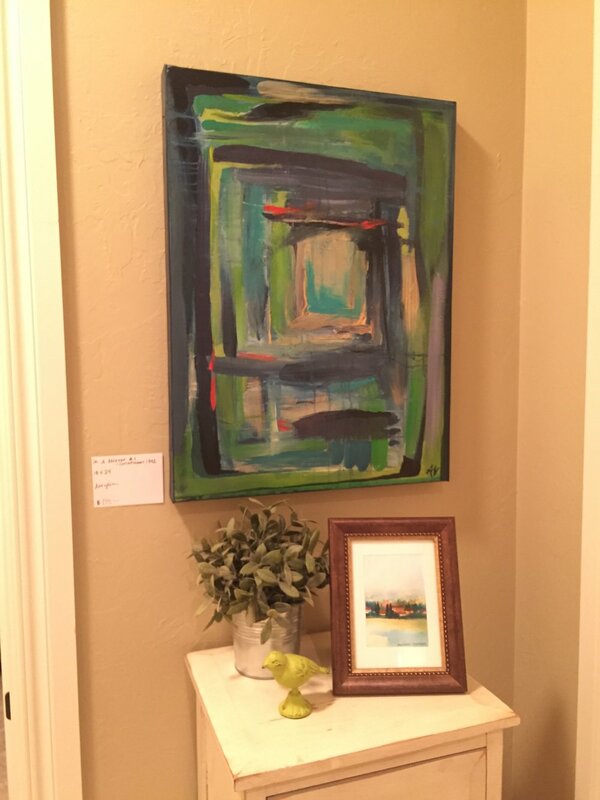 January was packed with art fun around here!Some of my art students entered their work in the local "Juried Art Show," put on by the Fine Arts Institute of Edmond! Two of my students won ribbons with their pieces! I was able to be an art student with my mom for 3 days! It was so much fun & we learned so much too! 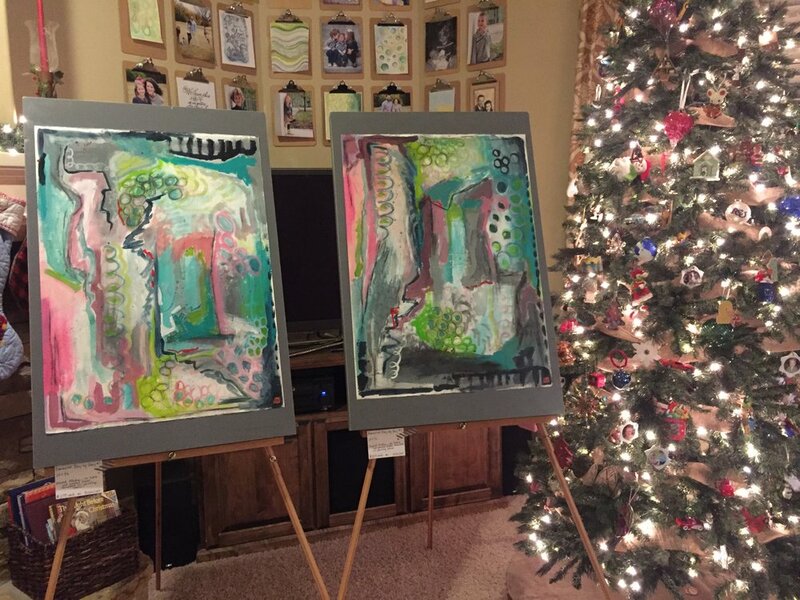 We went to a Robert Burridge workshop in Ft. Smith, AR. He was an amazing teacher, full of humor & endless artistic skill & techniques. We both walked away ready to lock ourselves in our studios & paint our hearts out! I was so inspired when I returned home from the workshop that I did a little rearranging in my studio. I bought new tables for my art students & created this creative corner for myself - an area where my paints & paintings can stay out & ready whenever time permits & inspiration hits! A quick update on my art classes - currently all 4 of my classes are full! I have a waitlist for each of my classes, so please let me know if you would like to be added & you will be the first to know if a spot becomes available. I will be posting information about my Summer Art Camps in early March! So be watching for that! Happy Creating! 'Let's Create!' 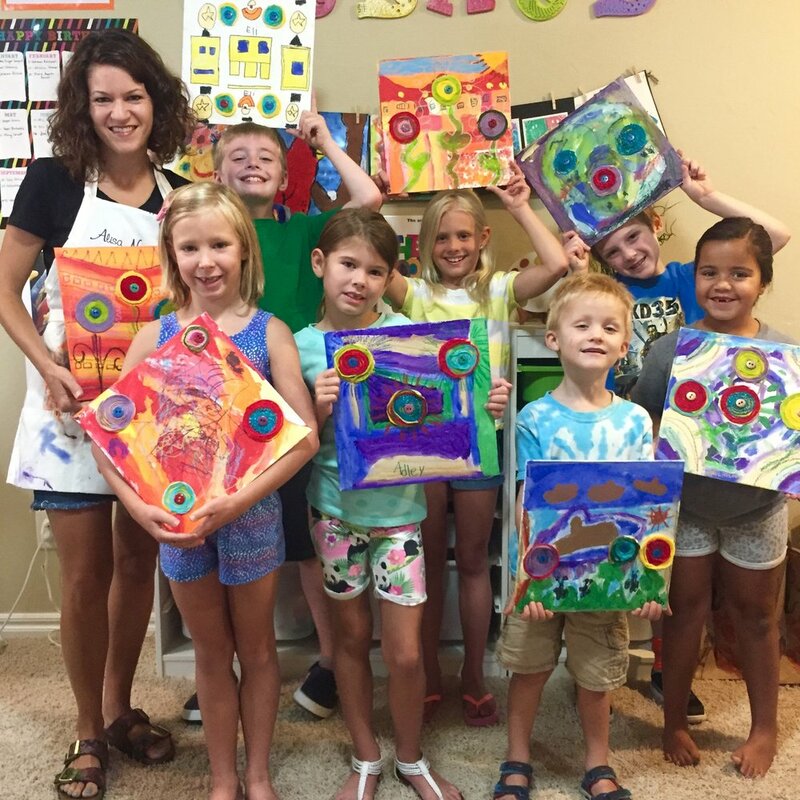 Summer Art Camps! It's hard to believe, but summer is right around the corner! I am looking forward to teaching "Let's Create!" art camps again this year! I am offering three different camp times - two in June and one in July. Students will come to my art classroom for 3 days, 2 1/2 hours each day. Our time will be filled with creating and learning about art! Painting, drawing, creating portfolios, and doing projects reflecting styles and techniques of famous artists are just a few of the activities we will do! Each day we will have a short break with snacks and games. At the end of camp students will take home a portfolio packed with their creations. Look under my 'Art Lessons' tab and click on the 'Let's Create!' tab to find all the information. Receive $20 off tuition when you sign your child up between now & May 10th! 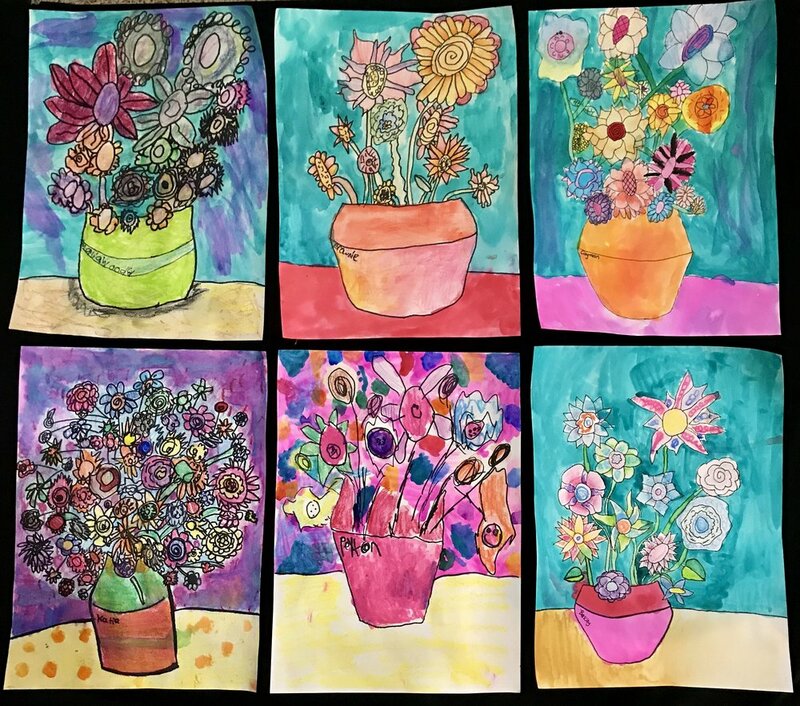 If your child is going to be in Kindergarten through 5th grade and loves art, one of my camps may be the perfect way to help them stay creative this summer! I've been wanting to try a painting birthday party for a while. My son turning 7 was the perfect reason to do my first one. He loves Thunder basketball so our theme was easy to come by! We painted in my studio, had cake & opened presents. The kids did amazing on their paintings & had an extra special party favor to take home :) We had a great time! I stocked up at Ikea over Christmas break to give my studio & classroom a lift. It was in need of some better storage pieces, new student chairs, a chair for me & a few other odds & ends. It's amazing what a few changes can do. I can already tell a huge difference in space & feel of the room! I am loving it!! All of my studio pics are accessible on the "My Studio & Classroom" tab. If you are interested in this painting or having a commission piece done for your home, please use my contact tab to get in touch with me! This was my first summer to host & teach two summer art camps! They were both a huge success! I had a great time creating with some very sweet & talented kiddos! I am gearing up for fall art lessons, which will begin September 3rd! Enrollment has begun & my classes are already half full, so if you are interested in enrolling your child, contact me soon! Click on the Art Lessons tab for all the info! I just got off the phone with PayPal - they agreed to remove all the transaction fees (it was 74 cents per print) from my Tornado relief watercolor print sales...so that's even more to donate!! I will be donating over $800 to Life Church OKC "Relief & Restoration" fund this weekend! Thanks again for all your orders & support! And thanks to PayPal & FedEx Office (donated all my printing) for their generous donations as well! I watched the Moore tornado in its' entirety on tv - from formation until it stopped. It was very emotional to know that this destruction was occurring 20 miles from me while I was sitting comfortably in my home. I started thinking of what I could do to help. 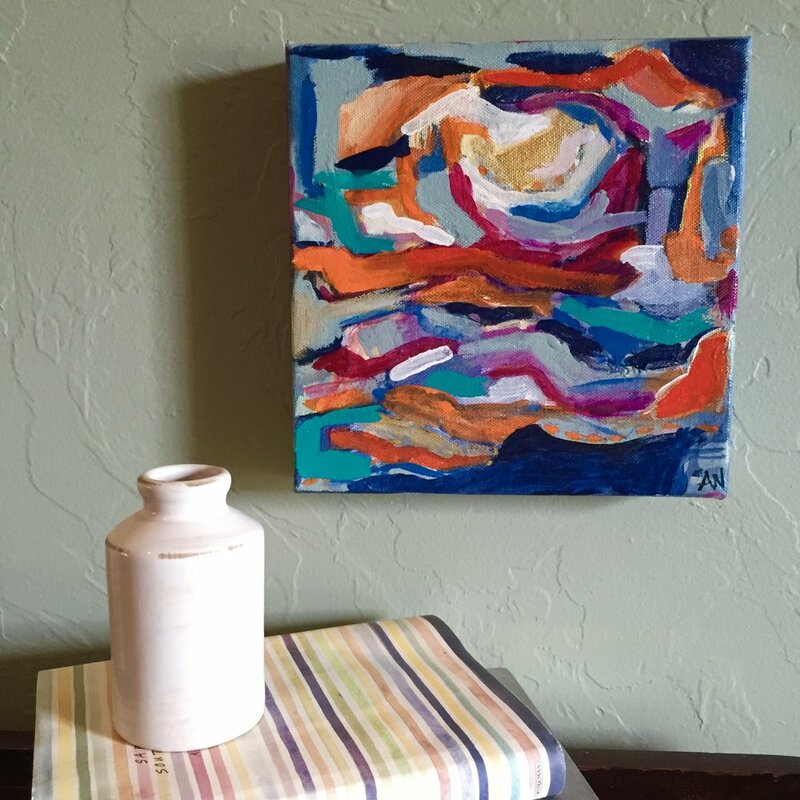 So on Tuesday afternoon, the day after the tornado outbreaks, I painted this. I chose gray & blue to signify the storm. I chose this verse because in times of suffering it is powerful to think upon the Lord's return & His control over everything, especially the things we don't understand. The watercolor/ink print is size 5x7 & printed on high quality, acid-free paper. It comes in a clear, protective envelope, ready to frame or give as a gift. The 'Buy Now' button below will allow you to purchase through PayPal. If you live near me & don't want to use PayPal, or if you prefer mailing me a check, you can do that too! Just email me at alisa@alisanelsonstudio.com or message me on FB - facebook.com/alisanelsonstudio. Please allow 2 to 3 weeks to get your print. Again, I will donate ALL sales from this print to the OK tornado victims.